The Jollie Biker will meet you on arrival in Twizel and transfer you to your accommodation. After introductions are made, we’ll have a bit of a chat about the exciting days ahead to ensure your trip will be as comfortable and memorable as possible. We’ll then fit you out with your bike and gear.Maybe enjoy a tasty dinner out in one of the great restaurants in Twizel – we’re happy to give you recommendations and can arrange bookings if you like. Option 1 (54kms) – If you want a gentle start to your tour, we can drop you at the Tekapo Town for a leisurely 30km ride. 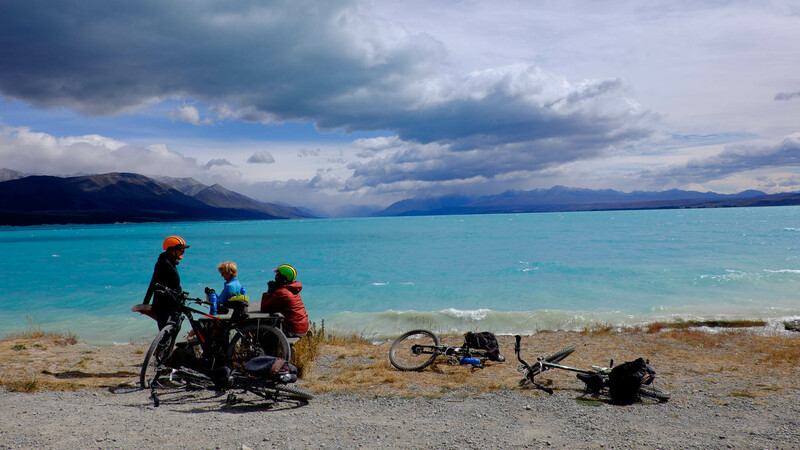 You will cycle past the Mt Cook Salmon Farm taking in views of the magnificent Mt Cook and beautiful Lake Pukaki from the top of the Penstocks. An exhilarating ride down the zigzag to Hayman Road takes you to the shores of Lake Pukaki. Hopping onto the bike trail here will lead you back to your base in Twizel. Option 2 (42kms) – For those wanting to push themselves a little more, we will drop you at Braemar Station (42km) or a little further on to Aoraki, Mt.Cook Station car park (58km) for you to enjoy the first stage back as you meander around the shores of Lake Pukaki. You will end up back in Twizel again for your second night. Today’s leg of the cycle trail takes you from Twizel over to Lake Ohau. The 39km ride will have you leaving Twizel, travelling up Glen Lyon Road and all the way alongside the Ohau Hydro Canal. There is minimal traffic making for an easy and safe ride. Once you reach the shores of Lake Ohau, you connect again with the Alps 2 Ocean off-road cycle trail. Journey through one of the most picturesque stages of the cycle trail until you arrive at the quaint Lake Ohau Village where you can spend your third night or travel a further 5km to your accommodation at Lake Ohau Lodge.If required, we can arrange for your luggage to be transported to your accommodation in Ohau. Setting off from Ohau this morning, you will enter into the final day of your tour with The Jollie Biker. Hopefully your muscles are well and truly warmed up, as you will find this a fairly challenging day of biking. The exciting 42km ride will take you through very different terrain than what you have already experienced. You will cycle through stunning native beech forest, explore the historical Quailburn Woolshed and enjoy a lovely downhill ride to Omarama. After such a big day, you will really have earned a chance to relax those tired muscles with a luxurious soak in the Omarama Hot Tubs. Once your muscles are working again, your Jollie Biker Shuttle will collect you at an agreed time to take you and all your gear back to Twizel. 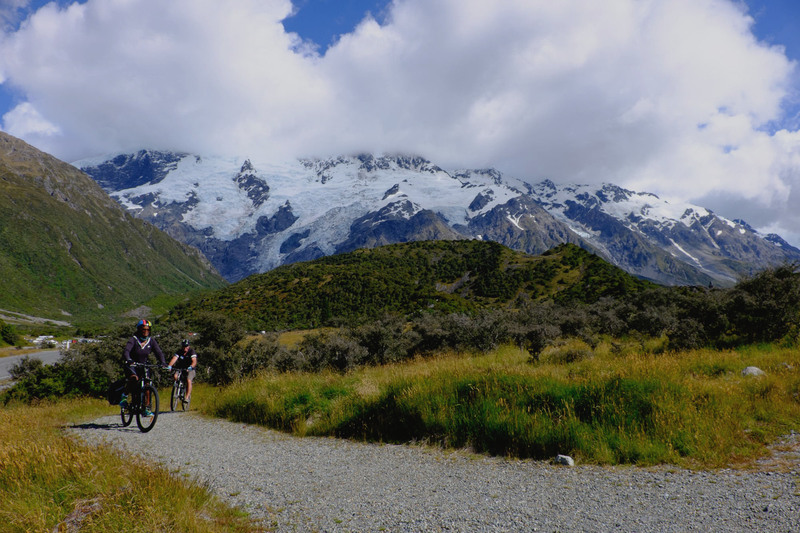 There are many amazing activities in the Mackenzie country area that we can also factor into your cycle trail itinerary if you feel like an afternoon or day off the bike. Scenic Helicopter flights, Heli Biking Trips, Lord of the Rings Tours, Glacial Sea Kayaking, Stargazing and 4WD Tours to name a few. All you have to do, is get on your bike and ride! But we can also tailor make trips for groups of four and more!